It would be hard not to be blown away by your first glimpse of the mercurial blue waters of Crater Lake. 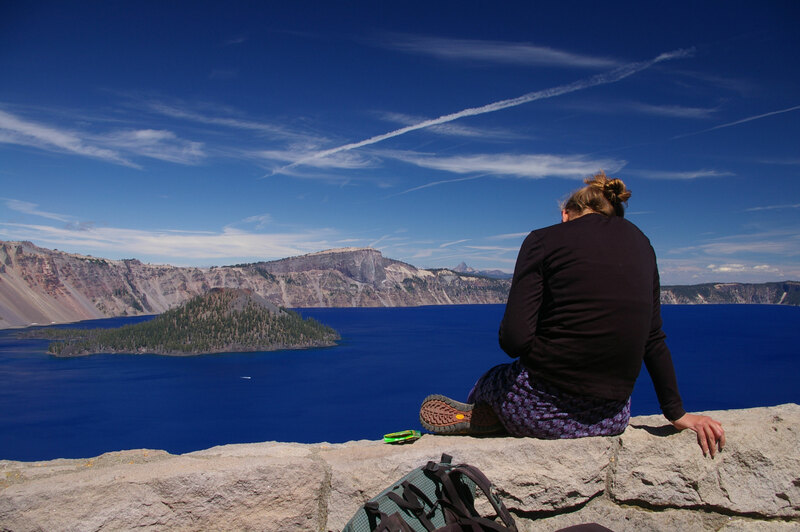 It was at Crater Lake that Cheryl Strayed seemed to turn a corner and start to heal. The PCT crosses 33 miles of Crater Lake National Park (off Highway 62), including 6 miles along the edge of the caldera with spectacular views of the lake’s mysterious waters. 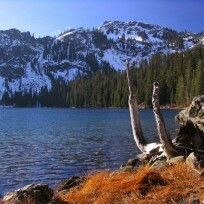 Begin your Crater Lake rim walk at the Crater Lake Lodge and head north. Along the way you have the opportunity to climb The Watchman and its lookout tower (offering perhaps the best view in the entire park). But why stop there? You can walk, cycle, or drive 33 miles around the entire lake. Along the way there are more than 20 scenic overlooks and opportunities to climb peaks and picnic abound. Between June and October you may be lucky enough to see the deer and elk that roam the park or even glimpse a herd of pronghorn antelope. Crater Lake National Park was designated in 1902 by President Theodore Roosevelt. Rim Drive was completed in 1915. Today, the 180,000-acre park receives more than 400,000 visitors per year. Snow may linger until late June and begin to fall again in October, so plan your journey for summer months and call ahead to check conditions. In the western waters of the Crater Lake below The Watchman sits Wizard Island, a small cinder cone that has erupted several times since Crater Lake’s mother mountain, Mount Mazama, collapsed thousands of years ago. Wizard Island’s high point is 763 feet above the lake’s surface. You can get to the island on a boat operated by a National Park Service concession. Then, it’s an easy climb to the summit, from which you can peer into the Wizard’s 300-foot wide, 90-foot-deep crater, one of the best-preserved explosion craters in the Cascades. The boat tours other areas of Crater Lake as well. Visit Crater Lake National Park’s information center at Rim Village for more information. With a depth of 1,943 feet, Crater Lake is the deepest lake in the United States and the seventh deepest lake in the world. The captivating blue color of the lake is the result of both its depth and its clarity (visibility has been measured at 142 feet.) Interestingly, despite its name, Crater Lake does not actually reside in a crater but rather in a caldera far larger than the crater of its original volcano, Mount Mazama. More than 7,000 years ago, Mount Mazama (at the time 12,000 feet high) erupted, spreading volcanic matter over 350,000 square miles of the Pacific Northwest. In the process, much of the surrounding landscape was covered with cinder and ash. Even today the environment remains affected. Near Crater Lake, for instance, the PCT crosses the so-called Oregon Desert. The soil in this arid landscape is full of remnant pumice and is so porous that rainwater infiltrates quickly, leaving little on the surface for trees or thirsty hikers. After Mount Mazama blew her top, she collapsed in on herself, leaving a 20-square-mile hole (or caldera) more than 3,900 feet deep. Slowly, rain and snow filled the caldera, eventually reaching the current lake depth of 1,943 feet. Over hundreds of years, Crater Lake’s depth has remained essentially unchanged. Generous amounts of winter snow, averaging 533 inches per year, continue to supply the lake with water. Distance: Pick your distance. Walk the rim as far as you’d like before turning around. Visit the Crater Lake NP website for bus, train and plane information. The park’s north entrance is closed in the winter and spring. Dates can vary, but typically the north entrance is closed from early November to June. Please call park dispatch for the latest road status (541)594-3000. From Roseburg – Route 138 east to Route 230 south to Route 62 east to the park’s west entrance. From Bend – Route 97 south to Route 62 north and west to the park’s south entrance. Permits: Backcountry permits are required for all overnight stays at backcountry designated sites and for dispersed camping. A free backcountry permit must be obtained before heading out. You can obtain one the day of your departure at the park’s visitor centers or ranger station. Special regulations: No pets, bicycles or motorized vehicles are permitted in the backcountry.